Tree skirts are an extension of your Christmas decor, but purchased skirts are often uninteresting. Create a cozy and festive stage for your holiday gifts with a handmade crocheted Christmas tree skirt. This free tree skirt pattern features five-sided granny squares and stripes that form an abundance of full folds. Intermediate crochet skills are recommended for this project. This tree skirt resembles one half of a crocheted ripple pattern. It is increased at the peaks, but it is NOT decreased in the valleys. The lack of decreases is what creates the full ruffle of the skirt. Download and print the pattern by clicking on the image below. If you need help to download the pattern, try these helpful tips. If you like this pattern but would like to personalize it with your own preferences, try one of these options. Crochet your skirt using all white yarn for a beautiful snowdrift option. Choose one, two or multiple colors to coordinate with your Christmas decor. The body of the skirt is stitched using double crochet. If desired, change the texture of the skirt surface by working combinations of single, double and/or triple crochet rows. Ribbons can be substituted for the buttons, or you can omit them altogether. Once the skirt is placed under your tree, the edges of the slits will not move. Crocheted Christmas appliques attached to the skirt can add an extra touch of whimsy to your decor. Like home decor, Christmas decorating can fit many design styles. Check out these options for more free patterns to fit your personal style. 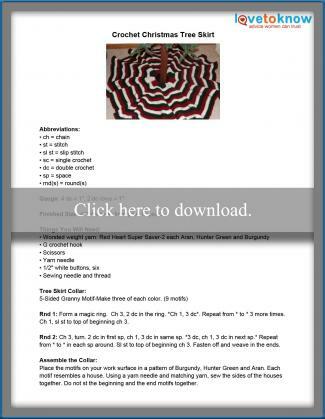 For a tree skirt with vintage charm and eclectic color, try your hand at this pattern from Red Heart. It is suitable for a crocheter with intermediate skills. Love the Country has an adorable tabletop tree skirt that features ribbons and bows. This pattern is quick and perfect for an intermediate stitcher. Crocheted holly leaves and berries add the finishing touch to this crocheted tree skirt from Mom's Love of Crochet. This project is perfect for a beginner and is made using two strands of yarn. A crocheted Christmas tree skirt is a major time commitment. Since you will want it under the tree before you start adding gifts, it needs to be ready when you start decorating for Christmas. A great time to work on this project is during the summer when it is too hot to go outside. Turn on a movie and get a few rows in whenever the opportunity presents itself.